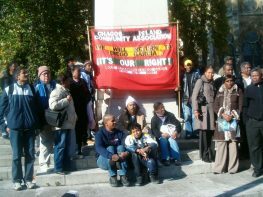 The Chagossians were forcibly removed from their ancestral home on the Chagos Islands by the United Kingdom in the 1970s and the United Kingdom Government has refused to allow them to return. The Chagossians now live in poverty and marginalisation in Mauritius, Seychelles and the United Kingdom. Adequate provision was never made by the United Kingdom Government for their housing, livelihood, employment, healthcare, social and community needs. They have suffered for over forty years as a result of their resettlement. The Chagos Islanders have tried to seek recourse through domestic legal avenues. The Chagossians are currently awaiting an appeal hearing in the judicial review application regarding the establishment of a Marine Protection Area (MPA) which covers the Chagos archipelago and prohibits any fishing or deep-sea mining in the area. The Chagosssians submit that the MPA, in effect, prevents them from returning to their homes because fishing is their primary livelihood. MRG has supported the Chagos Islanders for a number of years, including intervening in their European Court of Human Rights (ECtHR) case (which was ultimately declared inadmissible in 2012) and conducting advocacy before the United Nations. In March 2016, the Concluding Observations of the Committee on the Elimination of Racial Discrimination noted the Committee’s ‘regret that no progress had been made to implement the Committee’s previous recommendations to withdraw all discriminatory restrictions on Chagossians’ from returning to the Islands. MRG’s submission to the Committee in advance of its Concluding Observations highlighted how the exile of the Chagossians continues to violate Articles 1, 2 (non-discrimination), 5 (equality before the law) and 6 (effective protection and remedies) of the Convention on the Elimination of All Forms of Racial Discrimination. Significantly, in February 2015, a report commissioned by the United Kingdom Government found that there were no legal obstacles to resettlement of the Chagossians. Discussions on this issue were postponed until after the United Kingdom general elections and a decision on return is expected by the end of 2016. In March 2015, the UN Permanent Court of Arbitration in the Hague ruled that the United Kingdom had acted illegally by creating the Marine Protection Area since it had failed to adequately consult nearby Mauritius, and illegally deprived it of fishing rights. This amounted to a breach of the United Kingdom’s obligations under the 1982 United Nations Convention on the Law of the Sea. MRG continues to monitor the situation of the Chagossians and advocate at the United Nations. 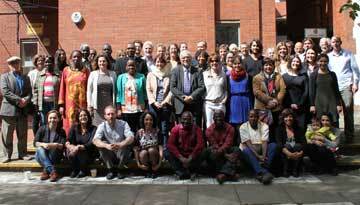 Most recently, MRG’s submission to the Universal Periodic Review of the United Kingdom, scheduled for 2016, recommends that the United Kingdom government recognise the violations that the Chagossians have endured after being removed from the Islands; remove legislative barriers to the Chagossians returning to the islands; facilitate and support the Chagossian’s right to return to the islands immediately; pay the Chagossians adequate compensation for the violation of their rights over the past forty years; and appropriately consult with and seek free, prior and informed consent of the Chagossians in relation to the return and compensation process.